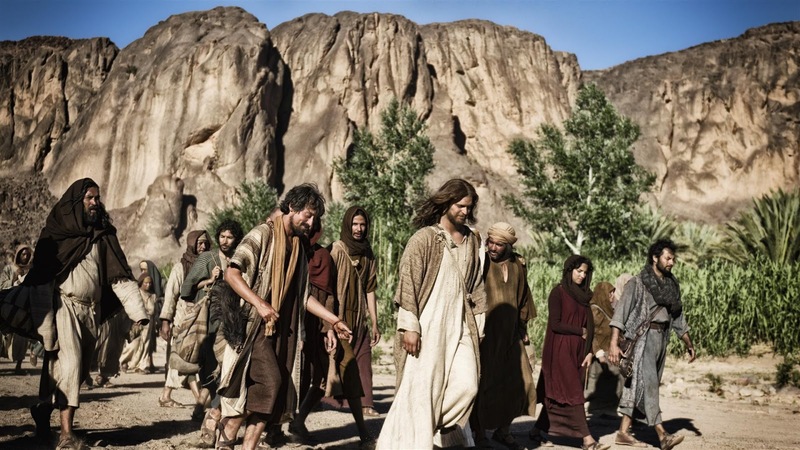 I have been blogging for some time about The Bible series currently airing on History Channel. We are now eight hours into the series, with the final two hours to come next Sunday (Easter Day). 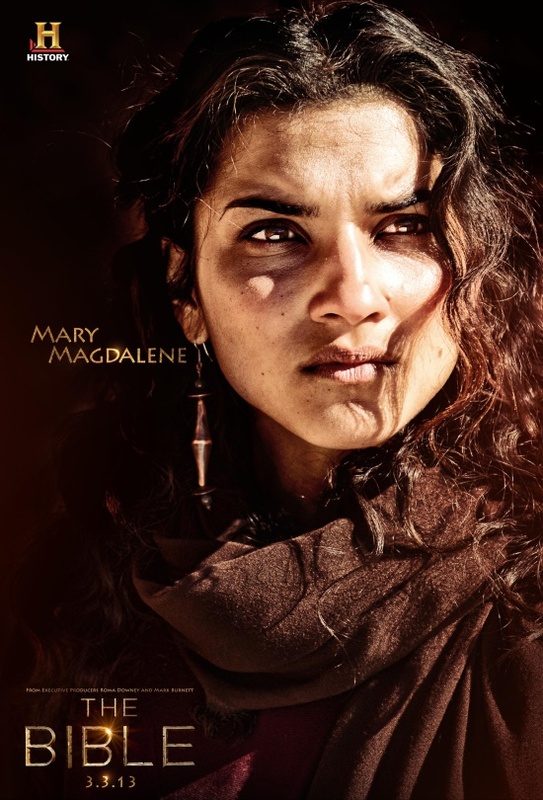 In this post I would like to turn to a feature of the series that has so far gone without comment in other reviews, the depiction of Mary Magdalene. 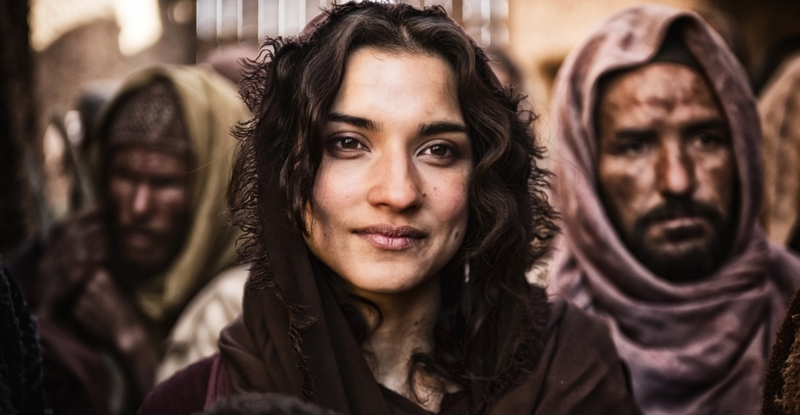 I will not hide from the reader just how thrilled I am with the way that Mary Magdalene (Amber Rose Revah, left) is played. In order to explain why, I will need to reflect first on the depiction of Mary in other Jesus films. Throughout the history of Jesus films, the depiction of Mary Magdalene has been disappointing. And that's an understatement. Some would say that it has been scandalous. It has been absolutely standard to depict her as the repentant prostitute, harmonizing Luke 7.36-50 (anonymous "sinner") and John 8.1-11 (anonymous woman taken in adultery) with references to Mary Magdalene (Luke 8.1-3, Mark 15.40-41 etc.). In Jesus Christ Superstar (dir. Norman Jewison, 1973), Mary (Yvonne Elliman) is the repentant prostitute, who now does not know how to engage with Jesus ("I don't know how to love him"). The character combines elements from all of those stories. Jesus castigates Judas for being judgemental, "If your slate is clean, then you can throw stones; if it is not, then leave her alone". Without her sinful past, there is no story. So too in The Last Temptation of Christ (dir. Martin Scorsese, 1988), Barbara Hershey's Mary Magdalene is depicted in the brothel, and her repentance is part of the action of the film. As in so many Jesus films, she becomes the woman taken in adultery found in many of our textual witnesses in John 8. She is dragged before Jesus and presented to him in a scene that is absolutely standard in Jesus films. When one is so used to this cliché, one almost comes to expect it in a new Jesus film. 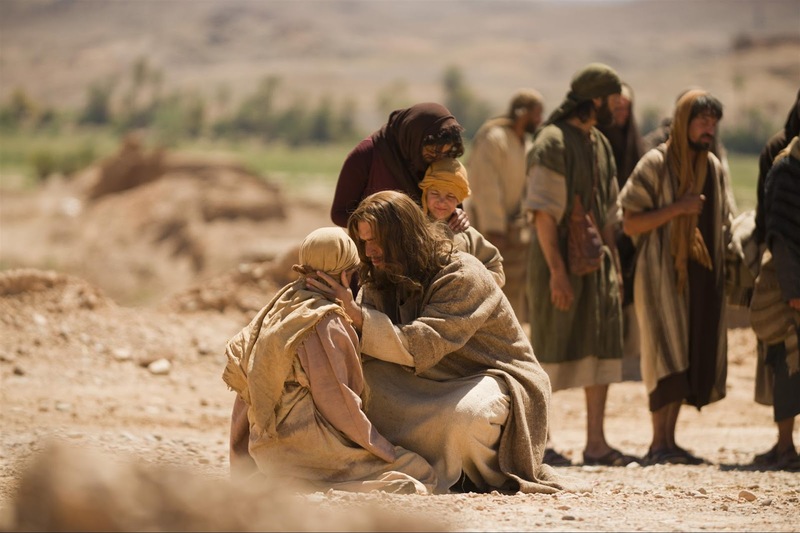 Surely, once again, we will see Mary Magdalene, the repentant prostitute, the "sinner" who comes to Jesus to anoint his feet, the adulterous woman who was nearly stoned but for Jesus' intervention. It is so standard a part of the grammar of Jesus films that it would be surprising not to include it. But of course New Testament scholars have been at pains for years in trying to rescue Mary's reputation. Books by Karen King, Jane Schaberg, Esther deBoer, Robin Griffith-Jones and others have underlined that the evidence for Mary the prostitute is nil. There is nothing in the New Testament to suggest that Mary was a prostitute. Moreover, the discovery and publication of the Gospel of Mary, alongside a critical appraisal of other early Christian texts in which Mary features, has served to rescue her reputation over the last generation or so. Of course the Gospels depict Mary as one of several women who travelled with Jesus -- Joanna, Susanna, Mary of James and Joses, Salome among them (Luke 8.1-3; Mark 15.40-41 etc.) -- but the narrative benefits from homing in on one key character, just as The Bible series singles out Peter from the inner group of Peter, James and John. I remember the late Esther de Boer writing to me back then to express her delight that finally there was a Jesus film that did not depict Mary Magdalene as a prostitute. I only wish she were still alive, and Jane Schaberg too, to see Amber Rose Revah's wonderful portrayal of the character in The Bible series, and I dedicate this post to their memory, with great affection and gratitude for their scholarship. 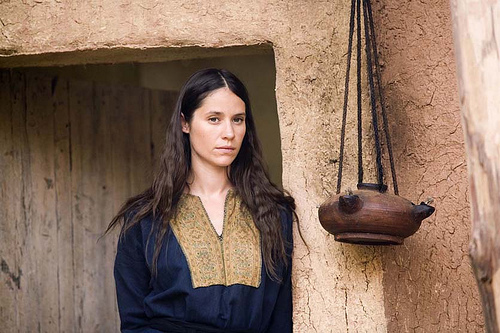 Did you think Mary Magdalene was equated with Mary of Bethany in the Bible series? I remember during the raising of Lazarus scene, Mary Magdalene greeted Martha, and there was so other character that appeared to be Martha's sister, so I assumed Mary Magdalene was being depicted as Mary of Bethany. Hi Mark, There is at least one other movie where Mary Magdalene is depicted simply as a follower of Jesus, though it is the text itself that forces this: Gospel of John, with Christopher Plummer and Henry Ian Cusick. Although Mary appears way earlier in the movie than in the actual Gospel of John and is still "flashier" than one would want, she is not depicted as a prostitute or the woman caught in adultery. I watched the whole series and have to say they protrayed her as one of the disciples, the lead one. She was in almost every scene and always close ups. She was a follower sure but she wasn't a disciple. They protray as some strong super woman carrying the men and in control, this is false and should not have been protrayed. There is no way a single woman would have been with 13 men all alone all the time, during that period. She wasn't on the boat when JESUS walked on thewater, but there she was in control and close up shots. I and my mother did not like this and believe it was done in a feminist context, to show women as power over men. I figured she was the wife or girlfriend of the producer or something, there was no reason for this blatant over the top presence in this series, none! Thanks, Jack. I was wondering about adding reference to Gospel of John, not least as it had a good cast of academic consultants. I seem to recall that although Mary Magdalene is not the woman taken in adultery, she is nevertheless adorned in such a way as to suggest that she may have been a woman of ill repute? But I'll have to re-watch and update my post accordingly. Bob, I think it's important to take passages like Mark 15.40-41 and Luke 8.1-3 seriously; cf. my recent NT Pod on the issue. If memory serves, The Miracle Maker also made no reference to the western tradition that Mary was a prostitute. (Mary Magdalene is not an ex-prostitute in the eastern tradition.) It did, however, contain one of the few filmic adaptations of the biblical tradition that Jesus had cast several demons out of her. Right -- Julie Christie as Mary M. in a depiction of Luke 8.1-3. However, I think that Mary M. is depicted as the sinner from Luke 7.36-50, if memory serves. 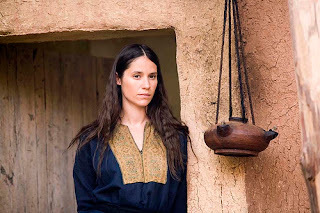 In response to Bob's comment - a recent status on Facebook made a similar case against The Bible miniseries: that it portrayed Mary Magdalene in a more feminist way; in a powerful position, holding authority over some men. As a woman currently in school to learn women's ministry and overall church ministry, I am ecstatic to see this portrayal of Mary. I read in a book that God does not need to settle for who He chooses for leaders; He creates them. Who's to say that Mary was NOT one of the chosen leaders? I believe that she was, and she was a faithful one, at that. There is a reason that she was by Jesus's side, and such a close follower of Christ. Thanks for this post, Mark! I loved it! A very respectful regards to sir Mark Goodacre .Sir , your site on New Testament is fabulous , scholarly and informative , thanks for it . I learnt a lot from it . I have read and enjoyed your book 'The Case Against Q: Studies in Markan Priority and the Synoptic Proble '. Excellent ! Sir , do you consider the authors of the Gospels to be eyewitnesses ? Thanks, Haley for your kind words. Thanks, Ali. No, I am not persuaded that the authors of the Gospels are eyewitnesses. Do you see any evidence for original Mark like original Acts being written in the first person? It's worth mentioning that Mary the Magdalene was probably not as young as the actresses mentioned. As a benefactor with her own resources it is more likely that she was old and perhaps widowed, isn't it? I felt that portraying Mary Magdelene as one of the apostles was pandering to wishful modern feminist thinking and unfaithful to the actual gospels. They transformed her into a modern woman of today, and gave her a central role that is not supported. They did Mary Magdelene a diservice , like somehow reality wasn't good enough for today. Why was Jesus's mother Mary, dispensed off to Nazareth after the crucifixion? In reality , John would have look after her, like Jesus asked. She stayed with the apostles , and was there at Pentecost, being in the room with them. By diminshing her role , ones biblical exegesis is hampered. She always points us to Jesus, at Cana she said," Do whatever he tells you." In Ant.3.3.4. (which follows Ant.18.3.3 where Christ and Christians are mentioned)there is a strange passage about a young woman. She had important ancestors, regularly conducted herself in a virtuous life, was well known, very rich, beautiful, most gay, yet very modest. This seems like a model for Mary. Richard, people are not young forever. But, I don't see why Mary should have have been old in order to be rich. Geoff, young women have had little time to accumulate wealth and are less likely than older women to have inherited wealth from dead parents or from dead husbands. If Lazarus is a real person, he lived with her sisters and apparently the three were single and rich. Isn't it possible that they were young orphans? So, It is possible that Mary Magdalene (=Mary Bethany?) were young. Excellent post! I, too, was glad to see Mary have a prominent role, though it would have been better if they had not depicted her as the ONLY woman traveling with Jesus and the disciples. 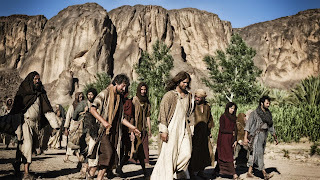 I was thinking that perhaps the most accurate portrayal would have been to have a group of about 30 men and women moving around Galilee, including Jesus, the Twelve, and Mary. As I read the gospels, that is how it seems to me that it really was. Thoughts? Gail, in the ancient world (except perhaps in Egypt) it was rare for women to travel, except in the company of male members of their households. One of the very few exceptions appears in the story of Thecla, who traveled with Paul and was sexually harassed on the journey. Traveling women would have faced dangers and possibly caused scandal. This goes a long way toward explaining why nearly all the apostles were men. Yes, there is Junia, but she is the exception that proves the rule since she will have travelled in the company of her husband, Andronicus. I am therefore not convinced that Mary the Magdalene travelled with Jesus all the time. When she did travel with him, I suspect that she was accompanied by male servants. Given the dangers of travel for women, we should suspect that the only women who accompanied Jesus were family members of male disciples and benefactors who could afford protection. That seems to be the case.